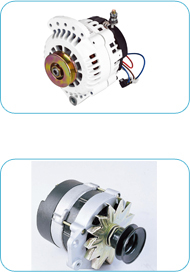 An alternator is a rotating machine supplying power for a vehicle's electric system and charging the battery. The increasing demand for electrical power in cars and the quest for weight reduction is driving the development of high power alternators: more compact alternators, more current producing. This development trend is pushing up alternator speed and operating temperature. Both factors are significant in the selection of a suitable bearing solution. Alternators work in a difficult environment. Engine assembly packaging has often exacerbated this condition by placing alternators in locations where they are more exposed to road-spray or close to the high temperature of the engine's exhaust system. With the requirement for operation in cold-climate starting and hot-climate motorway conditions, alternators must span a very wide operating temperature range, typically from 40 °C to highs approaching 200 °C. High speed alternators run at three to four times engine speed, so the alternator will be subjected to speeds, albeit for limited periods, in excess of 20,000 rev/min. It is important to make various improvements in response to requirements for high-temperature, high-speed performance. Some technical breakthroughs in HCH have been achieved which have contributed to HCH alternator bearing specifications being what they are today. The most noteworthy among them was the development of new grease which eliminated the peculiar problem of early flaking in the outer rings of alternator front bearings. The breakthrough of high-temperature resistance seal material has greatly improved the life of automobile alternator bearings. High efficiency type alternators as shown in the left picture and water cooled alternators have been developed in order to improve power generation efficiency and lower noise level, and for these rotor support bearings, extremely high heat resistance is required in most cases. The research and development of new seal structure for alternator bearings to meet the escalating requirements of our customers is ongoing at HCH. Most people don't think much about their starter motor until it stops. Car starters and truck starters have to deliver loads of torque for cranking vehicle engines in all conditions. In cold weather, battery drain and oil viscosity take their toll on the starter motor. In hot weather, starter heat soak can lock an iffy starter up. Either way, you're not getting anywhere if your starter motor decides to give up the ghost. Moreover, high-torque starter motors and gear-reduction starter motors are available for a highperformance or race engine. We've got you covered there too. All of HCH bearings for car and truck starter motors meet rigorous quality standards and are guaranteed to work with your application. Since starter motors face a wide range of temperature and the operating speed are usually high (can reach 10000 rpm), HCH offer synthetic grease that can suffer the temperature range of -40 C to 200 C. with good fatigue resistance characteristics. For the rubber sealed bearings, HCH offer optimized sealing design for your requirement of high running speed and low torque. Recently, a starter generator show in the left picture, a new type of alternator with an added function as a starter is already in the market. The purpose of a starter generator are: an easy drive change from a motor to an engine, smooth re-start after a vehicle or an engine stops, and regeneration of brake energy while hybrid vehicles are running. By adding starter function, higher belt tension is required and higher load is imposed on the bearing at start time, and then a higher capacity bearing is needed. For drastic reduction in fuel consumption in the future, hybrid technology of an electric motor and gasoline engine as exemplified in idle stop is requisite. 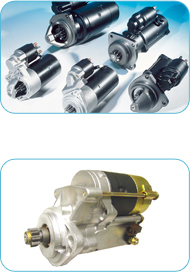 Starter generators are thought to be increasingly used in the future as essential accessories for hybrid vehicles. As the basic construction of a starter generator is similar to that of an alternator, the required specifications such as maximum rotational speed, heat and environmental resistance, and vibration resistance can be fulfilled by HCH technology accumulated in the alternator bearing development. HCH has already developed alternator bearings for high temperature of 180 C and 200 C, based on those for generally required temperature of 150 C, and they are now in mass production. Bearings of the HCH brands are characterized by high performance density, long operating life and maintenance-free bearing solutions in various installation points.